A series of lidar experiments has been conducted using the Atmospheric Balloonborne Lidar Experiment payload (ABLE) as a demonstrator of the development of the needed technology for space lidar platforms, to be deployed in the future on the Space Shuttle or on a dedicated satellite. 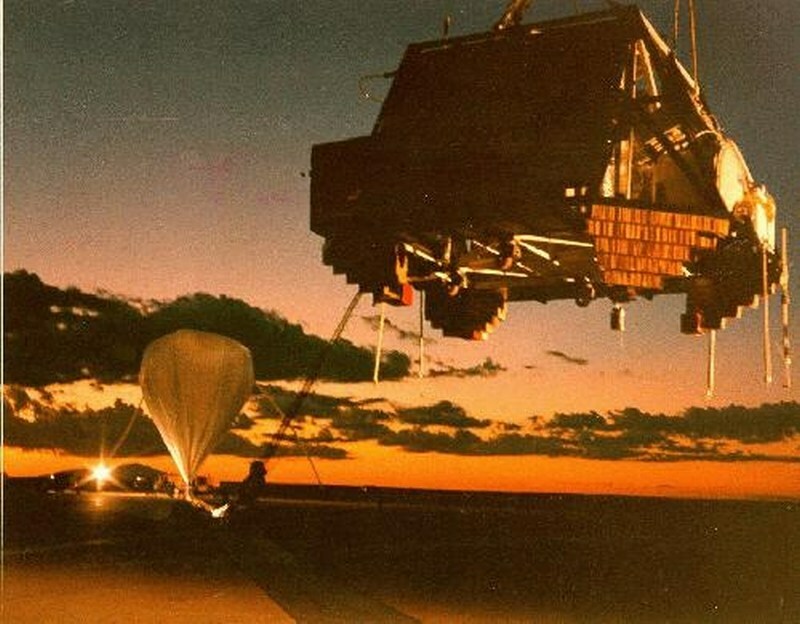 The program was conceived in 1981, and successful flights occurred in 1984, 1987, and 1988, followed by groundbased measurements made in 1989 and 1990. The ABLE lidar used a biaxial optical system with a multimode, frequency tripled, Nd:YAG laser transmitter and 50 cm Dall-Kirkham receiver optics. The flashlamp-pumped laser transmitter and power supplies were mounted in hermetically sealed pressure chambers which were maintained at an ambient pressure during flight. The flashlamp thermal power was removed from the rod cavities by a primary cooling loop containing a mixture of deionized water and ethylene glycol, and transferred through a liquid-to-liquid heat exchanger to a secondary trichloroethylene cooling loop. This loop circulated the coolant through two outboard radiators where the laser system thermal load was dissipated by radiation and convection. When the payload was configured for flight with batteries, balloon control electronics, telemetry electronics, ballast, and a recovery parachute, the launch weight was approximately 1270 kg. The biaxial lidar system was mounted on an optical bench made of a rigid trussed structure of welded aluminum angle. Prior to payload fabrication, extensive structural and thermal analyses were performed to predict structural deflections. An onboard microcomputer-controlled CAMAC system provided the lidar timing, current and pulse counting detector data digitization, analog housekeeping data acquisition, pointing mirror and filter wheel motor drive controls, uplink modem command interface, and downlink IRIG PCM data formatting. The unprocessed lidar PCM data were downlinked on an S-band telemetry link at 246 kbit/sec. The lidar data were recorded and graphically displayed in near real time at the ground station. A 300 baud command uplink provided real-time experiment control. The lidar could be commanded to point 30° from zenith, in the horizontal direction, and 2° from the nadir. The pointing of the lidar in the azimuth direction was not controlled but was monitored by a magnetic compass. Lidar beam steering was provided by a small multilayer dielectric laser pointing mirror and a 50 by 72 cm plane receiver pointing mirror. These mirrors were mounted on a common rigid shaft so that thermal variations did not affect their co-planar alignment. Lidar safety was a major consideration in the operational planning for each flight. Laser operation in flight required the simultaneous transmission of commands from the ground station to the payload over two independent RF links. During flight, nadir lidar operation was not permitted unless the payload was above a specific altitude and over White Sands Missile Range, NM. Prior to each launch the flight configured payload was subjected to a simulated flight test, in an environmental chamber, at the thermal and pressure conditions to be encountered during ascent and float. The launch, originally scheduled for 25 August 1987, was delayed for five days because of poor weather conditions. At 20:21 hours MDT, 30 August 1987, the ABLE II payload was launched from the taxiway of the Roswell Industrial Air Center. The payload launch was very smooth, and no shocks to the payload were evident. At 21.42 MDT, when the balloon was at 70,000 ft MSL, command and control were passed to the Holloman Control Center. During flight two dropsondes were deployed to obtain and atmosphere profile directly under the balloon. The first sonde dropped at 2305 MDT on Aug 30. When the payload arrived over WSMR, the pointing mirror was directed toward the nadir. Laser down fire began at 0030 MDT, Aug 31. At 00:53 MDT the payload was put into the stow configuration in preparation for flight termination wich ocurred at 01.00 MDT. The payload was parachuted and ground impacted at 01.43 MDT in a point on the eastern slope of the San Andres mountains on WSMR land below Gardner Peak. Fortunately, the impact force was somewhat lessened because the paytoad struck a small juniper tree, and although the slope was great, the tow center of gravity of the paytoad kept it from rolling over. The balloon landed near Knob Hill in the San Andres Mountains and was not recovered. On 31 August 1987, (the morning following the launch), the recovery crew drove out to the impact area and located the payload. The crew was dispatched early so that the system could be secured before the late morning surface winds could re-inflate the parachute and cause damage to the payload through dragging. A small Army helicopter met them at the WSMR RAD site, the nearest approach by land vehicles. It then ferried Visidyne personnel in one by one to a safe landing spot from which they hiked the remaining half mile to the impact site. By following the established recovery safety procedures, they determined that the laser was off and all payload power was shut down. Upon confirmation that the payload was safe, the other members of the recovery team were airlifted in, one at a time. Since the payload weight was too great for lifting by a waiting UH-lH Iroquois helicopter, the recovery crew stripped the paytoad of all separable packages, such as batteries, balloon control, backup balloon control, FAA transponder, etc. After this, it was concluded that the payload was still too heavy for the Iroquois helicopter, which was used instead for carrying out all the stripped equipment in a cargo net. Recovery was rescheduled and the next morning (1st September 1987) two helicopters, another Iroquois and a UH60 Black Hawk, met the recovery crew at the RAD site. The Iroquois airlifted the crew into the landing spot from where they hiked in and secured the payload for lifting. Then the Black Hawk helicopter, which has a lift capacity of up to 4 tons, lifted the payload to the nearest road where it was loaded onto a truck for shipment back to Holloman AFB. The requirements for this second flight of the experiment were to collect data for a one hour period over White Sands Missile Range at an altitude above 100.000 ft. Approximately 30 minutes after launch, a malfunction occurred in the lidar housekeeping data electronics which resulted in erroneous temperature and pressure data being read out at the ground stations. When the malfunction was detected, the lidar system power was recycled and the onboard computer rebooted, but no change in the data was observed. After examining the data, corrections were generated which permitted system operation monitoring to continue. When the laser was initially turned on, at an altitude of 60 kft as per the experiment plan, certain aberrations were detected. After the flight, at Holloman AFB an external examination of the payload structure was performed. The only evident damage was minor deformation to the bolted-on outrigger structure frame. The forward left side was broken and the aft left side was bent. These damages were designed not to affect the major welded frame, and indeed the major frame was not affected. There was no visible deterioration of the laser pointing mirror or the chamber windows. A small amount of the glass ballast and vegetation from the juniper tree were inside the telescope mount, but the mirrors were essentially unaffected. Finally, after deep examination the laser aberrations were traced to a misaligned beam, wich caused warm up and vaporized a portion of a rubber gasket, smoking the lenses.